By Dave Iltis – On a sunny and crisp spring day, the Sports-Am East Canyon Road Race took place at East Canyon Resort on April 15, 2017. 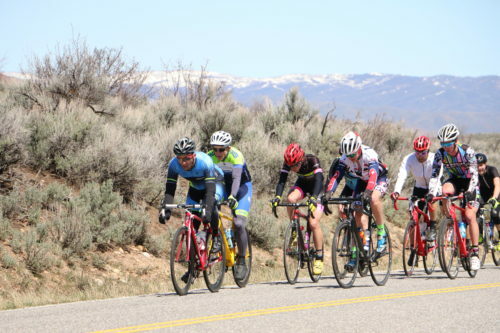 With a light road racing schedule in Utah this spring, the race had great attendance with over 240 racers lining up at the start. The 60 mile course was changed this year to start at East Canyon, instead of the top of Hogsback. This meant riders only had to climb the stairstep climb twice rather than the usual three times. But this didn’t keep the climb from being a major factor in the race. In the pro men’s race, locally-based Canyon Pro Cycling kicked off the fireworks from the gun with three riders setting a hard tempo. The pack held together for about three-quarters of the way up the first ascent of Hogsback, out of the East Canyon Reservoir. 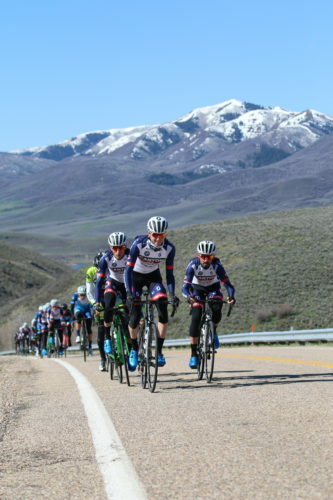 Paco Mancebo (Canyon), former winner of the Tour of Utah, and internationally known pro racer, attacked near the top bringing Fat Bike World Champion Rob Squire, and Arizona-based pro Chad Beyer with him. The trio of pros rode strong over the next 50 miles and were able to keep the peloton at bay despite a lot of work from the various teams. At the finish, Mancebo dropped off, and Beyer and Squire sprinted for the line with Beyer taking the win over Squire. In the field, the high-powered Canyon squad formed a lead-out train for Erik Slack, who finished fourth. Joe Waters and Rob Smallman rounded out the top 6. In the women’s field, the three women fought it out over the classic course. Mary Emerson (Plan 7) was dropped on the first climb, but regained contact. She attacked after the turnaround, but was unable to hold it. Alison Frye (Ski Utah), Jillian Gardner (Canyon), and Emerson traded pulls over much of the course until the climb back over Hogsback. Gardner was dropped, then Emerson, with Frye going over the top first. Emerson caught back on the descent, and then attacked Frye to solo in for the win. Other category winners were: Lindsey Stevenson (Team Endurance 360) – Women 3-4-5; Kelly Hunsaker (Plan7 DS) – Master 35+ Women; Mark Otterson (Zanconato Racing) Men’s 35-44; Ben Nichols (Canyon) – Men’s 45+; Mark Schaefer (Maddog Racing) – Men’s 55+; Darren Tuckett (Total Care) – Men’s Cat 3-4; Samuel McBride Men’s Cat 4; Jeff Phillips – Men’s Cat 4/5 35+; Owen Ala- Men’s Cat 5; Hunter Munns – Junior Men. 3 Deppe Bruce Cicada Racing Inc.
15 Erik Brockhoff Cicada Racing Inc.
9 Tim Jaggi Cicada racing inc.